Need an alternative to turkey this Thanksgiving? 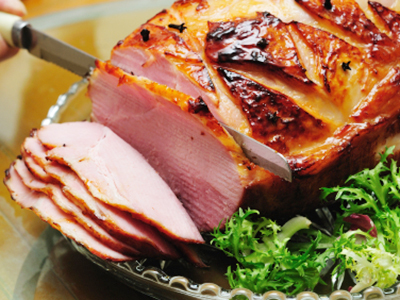 Baked ham may be the food that gives Southerners their taste for salty-sweet foods. It can be the perfect centerpiece for a festive occasion. 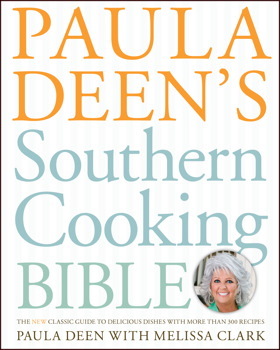 From Paula Deen’s Southern Cooking Bible. 1. Preheat the oven to 350°F. Place a roasting rack in a large roasting pan. Score the fat of the ham in a diamond pattern (see box opposite). Place the ham on the roasting rack. Bake for 2 hours. 2. Meanwhile, in a small bowl, whisk together the brown sugar, mustard, vinegar, and black pepper. 3. Remove the ham from the oven and spread the glaze all over the ham. Return the ham to the oven and bake until the glaze is thick and slightly caramelized, 30 to 40 minutes longer. 4. Transfer the ham to a cutting board and let it rest for 15 minutes before slicing and serving. Resting meat is one of the most important steps in serving it perfectly cooked. By resting the meat, you ensure that all the meat juices stay locked in and don’t come spilling out all over your cutting board when you slice into it. I like to tent foil over my roast when it’s resting so that it stays nice and warm. Never cover it tightly, or it will stew under there and lose the nice crust it’s formed. Scoring ham makes it look pretty, lets the fat render so that it crisps up, and helps the glaze seep into the ham better, giving you maximum flavor. To score your ham, remove the thick rind but leave about a 1/4-inch-thick layer of fat on top of the meat. Use a very sharp knife to lightly slice into the fat and create a diamond pattern over the whole surface. To carve a whole ham, create a flat surface by cutting a few slices from one of the long sides of the ham, then place that side flat on the cutting board. Starting at the shank end, make even cuts perpendicular to the bone using a long, sharp knife, working your way around the bone in a spiral fashion. Cut parallel to the bone to free the slices.